Gait re-education is essentially learning to walk with normal pattern again. It only takes a small injury resulting in mild pain, stiffness or weakness to affect the way you walk. Poor gait (or walking style) is not only inefficient, it can also cause compensatory injuries at, above or below the injury level. For example, an injured knee that affects your gait can cause foot, hip or back pain. Likewise it is very common that reduced movement in the ankle causes knee pain. A normal walking pattern is even more important when you start to run, which increases any abnormal stress forces into your joints and muscles – this is often the time that clients seek help for pain and discomfort due to biomechanical issues. Poor habits may become long-term, which can predispose you to other injuries or arthritis. 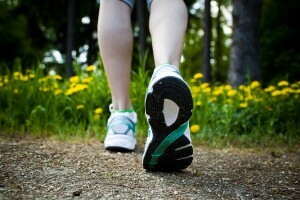 With weakness, injury or illness, your walking pattern can be very different from normal. You may dip down at the hip during stance phase, which can lead to hip bursitis or back pain. This can be quite subtle but is a huge problem for runners – it’s often when you increase your running distances that you start to notice you have a problem. You may have muscle imbalances which lead to abnormal stress and strain through the body when you walk or run. – in time these can lead to injury. You may find clearing the ground difficult in swing phase. This may lead them to swing the leg round to swing through and cause hip pain. You could have poor balance that some simple balance exercise could quickly improve to reduce your chance of a fall. Your physiotherapist is an expert in gait analysis. Simple tests and analysis of your gait will enable your physiotherapy to prescribe appropriate treatment and exercises to improve your gait helping you to achieve you physical goals. For more advice on your gait pattern (whether it be walking or very fast walking – running!) please consult your physiotherapist.